And Jehovah God said, It is not good that the man should be alone. I will make a helper suitable for him. He saw that it was not good for man to be alone, he needed a suitable helper. He caused Adam to sleep, and out of his rib, came Eve. She was the “bone of his bone” and “flesh of his flesh”. A suitable helper she was to become. When a man finds a woman, she becomes his wife. As a wife, you ought to be a Suitable Helper to your husband. I would like to add that more than that; You need to be a Sweetable helper, and a Sweet and able helper. Being a helper is not a bad thing. It’s certainly not anachronistic. It is not subservient. It is not low. It is not trashy. It is not being maligned nor being taken for granted. It is certainly not being weak or unable to fend for yourself. It is not lack of independence. It is beautiful and glorious, knowing that God saw it in his wisdom, that a man cannot make it on his own. He needs you Miss. To be his Mrs, and help him out! How amazing is that! Well, that doesn’t mean that if you choose to be single, as a man you are doomed. But singleness, whether you are a man or woman, has to have a purpose. Paul was single because he had a purpose. A purpose and a calling that was higher than him. Singleness, as the bible says, is a time to wholeheartedly serve the Lord, unfortunately we have really turned the course away from that. Nowadays, singleness is about fun and experimenting all our sexual appetites. A man needs a suitable helper, and for you to be a suitable helper, you got to work on yourself. Inside out. Your radiance should reflect on the outside. Fit for the Masters service, to present to His own creation-the man! Being a suitable helper, means that you have the capacity, will, capabilities, resources, mind, heart, wisdom, knowledge and time to sort out whatever will come your way with the help of Christ. A suitable helper can’t be a helper without getting all that from the one true source of all wisdom. The Lord. It all starts on your knees gal! On your knees! There is no way in this world you can go on living by your own strength. All the woman of the old understood that their true help comes from God. He is the giver of wisdom, He is the one to teach you how to love that man you have! He is your instructor in matters that you may not know about. In prayer, He shows you what is to come that you can laugh at the days ahead. He is the one who teaches you how to be discreet, with a heart that doesn’t fret but is calm, holding onto His never unending promises! Being a suitable helper means that you have to take the time to invest in yourself, make yourself better and able, so that when that time comes and you are called upon to do something, you can do it. In marriage, for you to be a helper to a man, means that you have the capability, wisdom and knowledge to sometimes see beyond what is superficial. That your husband can sit down with you, engage you in a certain area that he needs your input, and together, you will come up with a perfect solution. A suitable helper just doesn’t sit, and wait. A helper engages the person they are with at a certain task. Asking questions like, “Are you okay?” , “Do you need my help?” With that said, it means that as a woman, you constantly need to improve yourself, in every area of your life. Read; sharpen your knowledge in a certain area(s) that your husband is interested in. Widen your scope in everything and anything. Being a suitable wife doesn’t mean that you just sit and wait for your husband to initiate things. Let him come in the evening and engage him in a subject that you read and was of interest to you. He doesn’t need to buy your idea, but you need to be a constant challenge to him. A resourceful challenge i.e.-but gentle enough to let him lead. Take an example, if you have a friend who is so good with knowing the latest fashion trends around town, you would constantly engage her to know where to get the coolest jeans, tops, dresses, etc., right? That applies too in marriage. You need to be the never unending source of resource to your husband. You can’t know everything, yes, but he needs to feel that you, as his wife, is really resourceful. He needs to know that you the source of his motivation. That he can talk to you, after a stressful day, and he will be okay. You will constantly have some good encouragement for him. He needs to say, “My wife really prays for me.” You need to learn to always standing in the gap for him, and interceding for him, before God. You have heard of how men cannot multitask, which is true. Women can, and that is why they will cook, do the dishes, clean the house, the kids and still prepare a meal for the husband. A suitable helper can do all that, not buy her own strength, but by the divine enablement of the Lord. Yes we are all career women, I am too. Trust me, the Lord is able to renew you after a long day! That you can give your all at work, and still give your all to your husband. Trust the Lord with what seems “stupid”, like asking the Lord to give you strength to be pleasing to your hubby after a long day! I always do! A suitable helper has wisdom to pass her suggestions around, being submissive enough to let her husband lead her. She knows the right thing to be done, but finds ways to get it done without offending the CEO, or belittling his judgement. A suitable helper therefore, teaches her husband what her needs and a feeling are, and links them to his interests, to make him more receptive to her. She doesn’t just shove her needs down her husband’s throat, nor does she coerce him. A suitable helper can’t be a helper if she is not willing to help. She needs to will to help and support her husband through. It is important to note that we all have weaknesses. Am sorry but we cannot be equal to each other. Probably in opportunities but not in God give roles. A man’s role is in leadership; a woman role is more managerial, having to know all the home affairs inside out. Your husband cannot be as good as you. He will of course try, but, to be as perfect as you, he would have to be re-created to be a version two of you. That applies to the women too. A suitable helper therefore knows her role is not a competing one, but a complementary one to her husband. Your man’s weaknesses are complemented by your strengths as the woman and vice versa. Together you form a dynamic union. Unique to yourselves. You cannot duplicate your marriage to be as someone else’s, but you can borrow every principle and tweak it to your own. A marriage made in heaven. A suitable helper therefore is willing to offer more than needed without animus! That help extends to her fellow ladies, teaching them to be chaste, discreet and loving their husbands. A suitable helper does not underestimate anything, she does not assume anything. If she does not understand, she asks, in the most loving and gentle way. I mean! Cook if you can, then talk to your husband softly on a matter that bugs you. Look at Esther in the Bible. Imagine if your hubby’s friend is plotting to kill you! How many would have been like Esther? She inquired of the Lord. The Lord gave her a simple strategy, Cook for your king! Most ladies would have taken to Facebook! For others the night would be about fighting the man who is so dumb to know his friends ways! I said it all starts with your knees! Talk to the Lord on how to communicate to your husband on what ails you! A “Sweetable” helper does the husband good, everyday, every hour. This is what being good to your husband means. That you can repay good unto him for all he has done for you. That you can, give him thanks to him for all the good things bestowed by him on you. That you will seek his interest, and promote his honor and glory to the uttermost. That all the good works you do, which you are qualified for, and ready to perform, are all done in his name and strength, and with a view to your husbands glory. That you will not do any evil willingly and knowingly against him, against his truths and ordinances; or that is detrimental to his honor, and prejudicial to his interest.! That is being good to your man! Are you good to your husband? Are you learning of ways to be good and pleasing to your husband. Marriage shouldn’t make you complacent. In fact, your bar should be higher in everything. Your prayers should be a top notch because it all starts from there! Your knees! Your organization, demeanor, looks, effort, everything! Being sweet to your husband, means, looking for ways daily to prioritize him, your marriage, loving him and pleasing him. You want your husband to be good to you? Why not be good to him first? Change evokes change. Transformation evokes transformation. You can’t sit there, complaining how your husband is ungrateful yet your mouth is full of sour words towards him. Contentious and bitter, that he would rather eat a dry crust of bread on top of the roof than sit with you in the house! The man can’t even breath when he gets to the house. Men are drawn to praise, admiration, and respect. I mean if your house help can afford to take his coat off, welcome him, serve him and you are there, spread out on the couch , or your velvet sofa, why wouldn’t he find you unattractive? It’s time for all women to go back to the basics. Of course, times have changed, but that is why GOD MADE YOU A WOMAN. You can adjust, you can learn, you can organize yourself. Marriage doesn’t need liberalization! And Feminism! The so called Female emancipation! We keep wondering why our parents sustain 30 years plus marriages and nowadays, hitting a 1 year mark is more than God. Marriage is God, daily, but ladies, we are losing the point! A woman can evoke every feeling in her husband. I am a living proof! A man can be extremely mean, or extremely gentle, depending on the buttons your fingers choose to press! Marriage can be the best life ever! But, can be a nightmare too! Be sweet to your husband. Just take 1 hour at-least , daily, to focus on him alone. No distractions. Just him. You will see a change in your marriage. 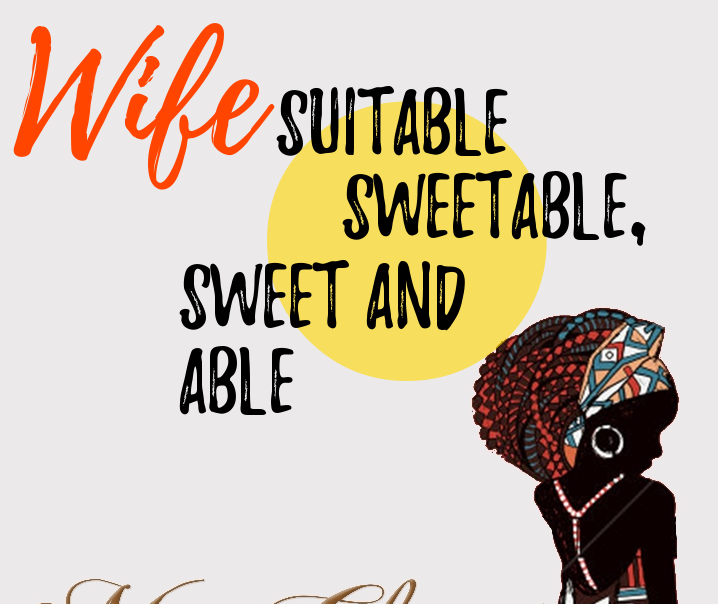 A “Sweet and Able” Helper as I have said, is about being super sweet to your husband. A change in your attitude, will evoke a change in him. More than that, be able to. By that I mean, expand your knowledge base. Research on ways and things that can enrich your marriage. Be Able to be a Suitable and Sweetable helper. Learn all you can, do all you can to make your marriage work. Keep improving yourself. Be a SUITABLE HELPER, BE A SWEETABLE HELPER, BE A SWEET AND ABLE HELPER! Previous PostLOVE REJOICES IN THE TRUTH.